How are you on this beautiful April Wednesday morning? Today's the day the Sugarspun Collection becomes available to everyone! Tantalizing treats showcased in beautifully decorated display windows draw you to the Sweet Shoppe storefront, beckoning you to step inside! Welcomed by the aroma of sweet baked goodies and sugar-laden confections, in no time at all, the mouthwatering scents of vanilla and almond have you convinced to browse and pick out an irresistible delight...after all, you deserve it! It's time to treat yourself and indulge in the newest and sweetest Sugarspun Collection! Special Savings: The Sugarspun I Want It All has a 10% discount, only available until April 13th or while supplies last! Your new collection will arrive packaged in a transparent zipper bag with hot pink trim, great for keeping organized and a FREE full color instruction inspiration sheet is included in every I Want It All! . Get yours today to ensure that you don't miss out on this special savings! Watch this video and join Emma Lou in the Heartfelt Creations craft room where she shares how to quickly and easily "whip up" a gourmet cupcake shaped card using her favorite tips and techniques! From die cutting a shaped card base, coloring, to adding realistic textured "frosting", you'll have the full "recipe and ingredient list" to create that extra special handmade "treat" to celebrate any occasion...without passing on the calories! Instructions: Cut a piece of white cardstock to 12 x 6" size, score and fold at 6" to create card base. Cut the 6 x 6" patterned panel shown, from the Sugarspun paper collection. Lightly sponge edges with Cactus Flower ink and attach onto card base. Stamp the sweet shop cart (2x) from HCPC-3873 Sweet Shoppe Cling Stamp Set in Archival Plum ink onto white cardstock and diecut with coordinating dies. Stamp the 'Sweet Shop' text in the same ink onto the 1st cart. For the 2nd sweet shop cart, only cut out the wheel. Stamp the set of 3 little cupcakes from HCPC-3872 Sweet Shoppe Treats Cling Stamp Set in Forget-Me-Not (1x), Cactus Flower (1x), and then also Bright Tangelo (1x) onto white cardstock and diecut with coordinating dies. Stamp the rock candy from the same set in Forget-Me-Not ink and Cactus Flower ink onto white cardstock and diecut with coordinating dies. Stamp the jars of cake pops and lollipops in Cactus Flower ink onto white cardstock and diecut with coordinating dies. 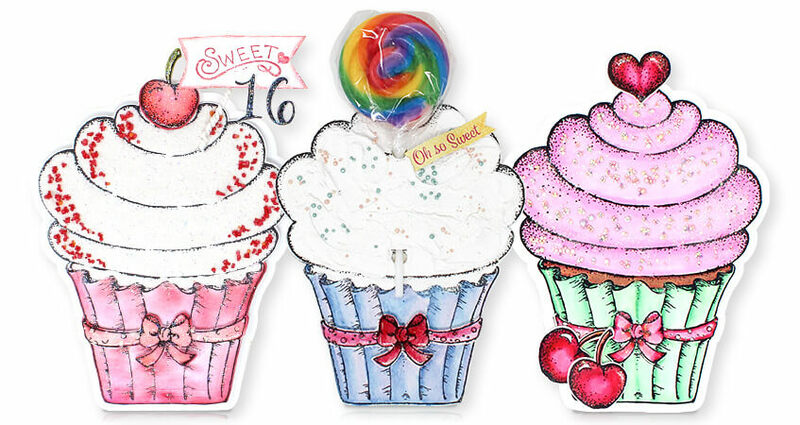 Use the Zig markers along with blender to color in the detailed areas on sweet shoppe treats and cart. The following markers colors were used, Carmine Red, Light Carmine, Cobalt Blue, Pink, Pale Pink, Brown, and Orange. You can use daubers along with the Plum ink on the base of cart. Use narrow dimensional adhesive to layer wheel onto cart. Use the double dots to layer the cart onto card and then attach the little treats as shown. Stamp the 'Let's Celebrate' in Forget-Me-Not ink onto white cardstock and diecut with 2nd smallest arrow from Arrow and Banners die. Sponge edges with Forget-Me-Not ink. Trim off point of the arrow and attach next to sweet shop card as shown. Use Dries White glue along with Crystal glitter over some of the strips on the roof canvas of cart and also along the front eyelet pattern of cart. Use the Dries Clear glue along with same glitter to add a sparkle over the sweet treats and rest of card as desired. Instructions: Click here to view more photos of this project. First cut 6 pieces folded card from white cardstock using cupcake outer die. Glue them and create an album. Take a piece of white cardstock measuring 2" x 1/2". Score lines on it and glue it as a binder. For the cover page stamp cupcake image on water color paper using Garden Patina Archival. Paint cup image using Zig markers. For cake apply Opaque Texture Paste on image and then stamp on texture paste using Rose Madder ink. Apply glitter on texture paste and keep aside for drying. Once dry, glue it on cupcake album. Stamp a cherry using Jet Black Archival and paint it with Zig markers. Cut image using coordinating die. Apply Crystal Lacquer on cherry. Glue it on cupcake after drying. Stamp a sentiment on white cardstock using black Archival and glue it as shown. For inner pages cut 13 pieces of cupcake from pattern paper using inner cupcake die and glue them. On the back side of cupcake glue magnet and the pattern paper. Cut round 12 frames from white cardstock using eyelet circle small & basics die. Apply glitter on all frames. Cut pictures of babies using circle die. Paste pictures on album and glue frames. To decorate pages, stamp some sweet shoppe treats images using black Archival on water color paper and paint with Zig markers. Cut images with coordinating dies. Cut some sentiments and small tags from designer paper using dies. Cut some designer paper using arrow dies to create banners. Glue elements on all pages as shown. To create closer, stamp and cut bow using cupcake stamp and die. Paint using Zig markers. Cut a strip of white cardstock measures 1/2" x 5". Glue bow on the center of the strip. Fussy cut the strip around the bow to create clean look. Glue magnet on one end of strip. Paste other side of the strip on back side of cupcake. Our magnetic closure is ready. Instructions: Prepare a 5 x 7" white card base and top that with a piece of the Sugar spun paper 1/4 inch smaller. Die cut one of the Lacy Diamonds out of white cardstock, cut in half and place one half on the right and one on the left. Stamp 3 of the Sprinkled Confetti Cupcakes and using the markers, color in with your choice of colors. Use the coordinating die and cut all 3 out. Place in the center of the card as shown. Stamp the Cherry with Plum ink, color in with a Red marker, cut out with the coordinating die, shape using the deluxe shaping tool and adhere to the bottom of the card. Stamp the leaves and flowers from the Tweet Cherry collection on the Deluxe Flower Shaping paper with the Plum ink. Color the center of the flowers with a yellow marker, color the leaves with a green marker. Cut everything out using the coordinating die, place in the matching mold and run through the machine. Arrange at the bottom around the Cherry. To finish, add glitter to the cupcake icing, flowers, leaves and cherry. Add Prills to the center of each flower. Instructions: Chose paper from the paper collection for both sides of each page of the card base. Cut 2 squares slightly smaller than 6" x 6" for the back of the card and adhere the most patterned paper to the back, then adhere the 2nd square to the front of this page and edge with melon mambo ink. Diecut with fleur border basics die, the papers for the remaining pages to the card, matching the die with the top edge of the cardbase. Adhere all the papers onto the card base. Cut sentiment and patterned strips from the paper collection and adhere onto each page of the card, at varying heights. Die cut a coordinating tag from the paper collection. Mask off the "shop" on the sweet shop sentiment and stamp onto the tag with Calypso Coral ink, cover in clear embossing powder and heat to set. Diecut 3 x 1's and 3 x 6's. Glue these together to make a thicker number and adhere under the word sweet. Add a little yellow ribbon in the tag hole. Die cut 4 elegant pocket dies from melon mambo card and glue them back to back to give you 2 sturdy pieces. Cover with crystal clear. Adhere 1 to the back page of the card and the 2nd to the 2nd page as shown - leaving some of the diecut unstuck - tuck the sweet 16 tag into this. Stamp the largest cupcake in melon mambo ink onto white card, cover in clear embossing powder and heat to set. Colour using the water colour pencils, create a separate bow in the same way and die cut. Adhere the bow to the cake and shape the cake using the flower shaping tools. Cover the frosting on the cake with crystal clear, and hot glue into position at the back of the card. Make 3 medium cupcakes: stamp 2 x using melon mambo ink and 1 with mint macaron ink, clear heat emboss as before and colour using inks or watercolour pencils. Diecut and shape as with the larger cupcake and add 1 to the back page and 2 to the 3rd page using hot glue. Make 2 small cupcakes: stamp using calypso coral ink, heat emboss with clear embossing powder as before and colour using inks. Shape with the flower shaping tools and add 1 to the 3rd page. Save 1 for the front page. Stamp the sentiment onto white stamping card using the calypso coral ink and heat emboss with clear powder. Die cut the sentiment using the eyelet strip and ink around the edges with calypso coral. Adhere to the card using foam pads. Fussy cut 4 cupcakes from the paper pad and shape using the flower shaping tool. Add to the front of the card, around the sentiment, along with the 2nd small cupcake, using hot glue. Stamp the cherry using poppy parade, cover with clear embossing powder, remove excess and heat to set. Colour using the poppy parade and mint macaron ink, die cut, shape and hot glue the cherry on top of the largest cupcake. Instructions: Card size: 5 x 4". Cut pink cardstock 5 1/4 x 12" and score at 4" and 8", fold at the 4" and cut 2 layers having the die off the folded edge about 1/4". Start the cut at the fold and place the top plate about 1/2" from the edge so that you don't cut through the next panel. Unfold and finish the edge cut then do the same for the third panel, place the die back on the middle section and fold the third in under it. Start at the fold and cut to within 1/2" of the edge and stop, unfold and finish cutting the third panel to the edge. Stamp and die cut the inside parts of the cupcake 4 times. Because 2 of the panels are "backward" 2 of the cupcakes need the tops cut off and turned around which is ok because the texture paste will be on the non-stamped side anyway. Color texture paste with re-inkers. While texture is wet sprinkle on the Prills and glitter. Let dry over-night. Color the cupcake bottoms with Copics. Stamp numbers, hearts and the 2 sentiments using Fuchsia. Wrap each cupcake bottom with ribbon. Cut out the sentiments with the arrow dies, shortening the larger arrow for the sentiment. Glue the hearts, numbers, and sentiments onto cupcakes. Add ribbon bows to cupcake bottoms (except the center cupcake with the larger sentiment). Instructions: Cut a piece of white cardstock to 8 1/2 x 5 1/2 " size, score and fold at 4 1/4" to create card base. Ink the edges with Sunflower ink. Cut the panel from the Sugarspun paper collection, die cut oval using die from the small oval set. Ink the edges with Magenta Hue ink. Cut clear cardstock slightly smaller than panel and adhere on the back of panel. To create the 3D cavity, cut 10 pieces of cardstock slightly smaller than panel. Die cut 9 of them using slightly larger oval from Eyelet Oval Large set. Adhere these 9 pieces together. On the last piece, stamp sentiment using Magenta Hue ink. Very lightly swirl Forget-Me-Not on the sentiment and Sunflower where the candle will be. Adhere the previous oval frames onto this stamped panel to finish the 3D cavity. Generously apply dries clear glue around in oval edges and allow to dry. This creates a sealed barrier, so your confetti won't wedge between the layers of paper. Stamp confetti in Sunflower ink twice and Magenta Hue twice. For quick and easy coloring of confetti use Stack and Store dauber to apply color to the front and back of cardstock. Add Crystal Lacquer to yellow confetti and brush around with sponge, front and back of cardstock. While lacquer is still wet, add crystal glitter on both sides of cardstock. Allow to dry. Add Nuvo Mousse to pink confetti, to both the front and back of cardstock using hydra sponge and allow to dry. Once all is completely dry die cut using coordinating dies. Now both sides of confetti is colored and embellished and ready for card. Stamp cupcakes, flower pot, macarons, and cake pops in Jet Black ink and die cut with coordinating dies. Stamp Cake Stand twice in Magenta Hue ink and die cut with coordinating die, color lightly with Red Geranium ink. Stamp birthday sentiment on yellow panel from paper collection using Magenta Hue ink and die cut using small arrow. Ink edges of arrow in sunflower ink. Color the remaining images along with Stack & Store daubers to color cupcakes with Vivid Chartreuse, Sepia, Magenta Hue, Sunflower, Forget-Me-Not, Majestic Violet, Red Geranium. Use same inks for cake pops, very lightly add Forget-Me-Not to glass vase. For flower pot use Sunflower, Magenta Hue, Vivid Chartreuse, Forget Me Not. Mon the macarons use Sunflower, Magenta Hue, Vivid Chartreuse, Forget-Me-Not. Use the stylus from the HCST1-401 Deluxe Flower shaping kit to shape the cupcakes, cake pops, macarons and arrow. Use scissors to cut second cake stand in half, using the base as the second layer on the cake stand. Adhere images on card panel as shown. Insert confetti and prills in cavity, adhere panel on top to create shaker. Adhere shaker on card base. Instructions: Using paper from the collection, cut the cupcake box using the cutting file from here. Assemble according to the instructions given. Add pearl strips as shown. Instructions: Diecut an A2 top fold Metallic Pearl card using the outside Sugarspun Cupcake Die to create card base, making sure that the top edge of the die is slightly off the edge of the card. Stamp the Sugarspun Cupcake on watercolor paper using VersaMark, sprinkle with WOW Sparkling Snow Embossing Glitter and heat set using the Heat It tool. Color using Zig Clean Color Real Brush Markers - Pink, Pale Green and Mustard and diecut using inside cupcake die. Diecut two more times from white cardstock and adhere together to create a stronger cupcake. Adhere to the card base. Diecut green paper from the Sugarspun collection and adhere to the inside of the card using dries clear adhesive. Stamp the Petite Florals on Deluxe Flower Shaping paper using Magenta Hue ink. Color using the same ink, diecut using the coordinating die, place in the Petite Floral Mold, sprinkle with water and run through the die cutting machine. Press down in the middle of each flower using the stylus from the Deluxe flower shaping Kit. Pierce the centers using the piercing tool and insert stamen. Sponge with dries clear adhesive and sprinkle with Rajni Chawla's crystal clear glitter. Stamp the Classic Rose Leaves on Deluxe Flower Shaping paper using Archival Olive ink. Color using the same ink and Leaf Green, diecut using the coordinating die, place in the Rose Mold, sprinkle with water and run through the die cutting machine. Sponge with dries clear adhesive and sprinkle with Rajni Chawla's crystal clear glitter. Using a paint brush, paint dries clear adhesive on the icing and sprinkle with crystal clear glitter. Adhere the leaves and flowers to the cupcake card as shown. Instructions: Click here for a larger photo of this project. Cut the Milk pack out of White Cardstock, fold all the lines and glue everything together, keep it flat and place the windows in it then close it. Cover all the sides and window display with the paper from the collection. Stamp with rich Cocoa the Sweet Shop, Sweet Shoppe treats and the sprinkled confetti Cupcakes on the Flower Shaping paper, color them with a mix of Teal zeal, Vermillion, leaf Green, Pink peony, Buttercup, Vibrant Fuchsia and French Ultramarine. For the tiny pieces you can use the Noo Blender Brush. Cut them all out with the coordinating dies. Place the Sweet shop in front of an opening, then put glue on all the sweets and cover it with the crystal clear, on the glass you can put some 3D Lacquer. Let it dry and place all the Items in the windows, on the cart. Also, in the other window on the back side, place the dieuts on a piece of acetate. Color the cherries with vermillion and put some 3D Laquer on them and let them dry! Get the ribbon through the holes and make a bow and glue 2 tiny cupcakes on the ends of them. Put glitter on the stars of the party hats and let them dry! Take a piece of rope and make a knot on the card then pull it along the side and make a hole, pull the rope through the hole get it all the way in the window, make another hole get the rope in it and at the end you can make a knot at the other side of the cart, then hang all the cherries and party hats on them. In between the macaron cookies you can put some Ivory Shell Nuvo drops like a filling. Instructions: Cut a piece of white cardstock to 9 1/2 x 5 13/16" size, score and fold at 4 3/4" to create card base. Cut the green 6 x 6 panel from the Sugarspun paper collection to 5 9/16 x 4 1/2" size trimming off the border, ink the edges with Vivid Chartreuse ink. Cut the dotted pink 6 x 6 panel from the Sugarspun paper collection to 5 9/16 x 4 1/2" size. Carefully tear the corners of the pink dotted panel, ink the edges with Magenta Hue ink. Die cut 6 Elegant Pockets from HCD1-7213 Elegant Pocket Accents, on white cardstock. Adhere 3 pieces together to create a thicker piece. Do the same with the remaining three die cuts. Scoop a small amount of Nuvo Mousse onto a non-porous surface and spray with water mister to dilute. Use the hydra sponge to apply Nuvo Mousse onto Elegant Pocket die cuts, allow to dry. Once dry adhere to green panel as shown and trim off excess using scissors. Attach pink panel with foam adhesives. Die cut 6 small diamonds from HCD1-7226 Diamond Basics die on two different papers from the Sugarspun paper collection. Fold each diamond in half and attach on a 7" string by placing the string inside the folded diamond and applying glue. Once banner is complete, attach onto panel using foam adhesive. Attach green panel on card base using dries clear adhesive, tucking ends of string behind panel. Stamp the cupcakes from HCPC-3871 Sprinkled Confetti Cupcakes using Jet Black ink on white cardstock and die cut with coordinating dies. Stamp the lollipops, cake pops and macarons from HCPC-3872 Sweet Shoppe Treats stamp in Magenta Hue ink on white cardstock and die cut with coordinating dies. Stamp Let's Celebrate from HCPC-3847 Celebrate Love Sentiments stamp using Magenta Hue ink on yellow paper from the Sugarspun paper collection and die cut using the small arrow from HCD1-7204 Arrows and Banner die. Use the Stack and Store daubers to color the images. Color the macarons with Magenta Hue and Forget-Me-Not. Use same two colors, along with Sunflower ink on the lollipops. Use Majestic Violet, Magenta Hue and Vivid Chartreuse on the cake pops. Very lightly add Forget-Me-Not on the glass vases. Color the base of the large cupcake with Forget-Me-Not. On the small cupcake, use Majestic Violet on the base, lightly swirl Sepia on the cake, and Sunflower on the frosting, and Red Geranium on the Cherry. Ink the edges of arrow with Sunflower ink. Use the stylus from the HCST1-401 Deluxe Flower shaping kit to shape the cupcakes, lollipops, cake pops, macarns and arrow. Apply Texture Paste using fingertips or plastic spoon, to the top of large cupcake. Apply a pinch of prills and a pinch of Crystal Clear onto Texture Paste and allow to dry. Apply Crystal Lacquer to cake stand, glass vases and cherry, allow to dry. Use Dries Clear glue and foam adhesive to attach images onto card as shown. Apply Dries Clear glue onto macarons, lollipops, cake pops, cupcakes and banner, sprinkle with Rajni Chawla's Crystal Clear and then tap off. Apply dries clear glue onto sprinkles of small cupcake, apply prills and tap off. If desired, cut a panel from paper collection to 5 1/4 x 4" and attach to inside of card. This finishes your card. Instructions: To prepare a Z- fold pop card, cut a smooth cardstock measuring 12" x 6". Score first at 3" and then at 6" on the longer side. Crease the score lines neatly using a bone folder. Choose a scenic paper with candy shop from the designer paper collection and cut 1/16" smaller on all sides to all the inside panels of the card. Glue the papers with glue as shown. Next, cut a strip of white cardstock measuring 2 1/2" x 12" and glue dotted paper on top. Score first at 6" and then at 9". Crease all the score lines and glue the strip as shown. Stamp the images from Sprinkled Confetti Cupcakes Cling Stamp, Sweet Shoppe Treats Cling Stamp Set and Sweet Shoppe Cling Stamp Set with black archival ink and cut all of them using their coordinating dies. Color all the images using Zig Clean Clear Brush Markers, for color blending use watercolor brush. Stack and glue extra 2 die cut to add extra strength to the painted embellishments. To create the sweet shop, Stamp, cut and paint the image and glue an acetate sheet from the back side. Stack and glue extra 3 die cut to create the dimensions. Glue painted candy jars in front of the window and then glue the sweet shop on the card panel as shown. Stamp the fence images from Tulip Cart & Fence Cling Stamp Set with black archival and paint them using Zig Markers. Cut the fences using its coordinating die. Glue 2 extra die cuts to add extra strength to all the fences. Once all the elements are ready, assemble the card as shown. Cut the sentiment from the paper collection using Ornamental Tags Die and distress the edges a little using distress ink and then paste it on the fancy tag die from the same set. Complete the card by adding detailing with micro fine glitters. Instructions: The finished card measures 7 inches by 5 inches. Cut white card stock to 10 inches by 7 inches and score at 5 inches on the longer side. Fold to make a horizontal top folding card. Cut a piece of pattern paper from paper collection a little smaller than card base and adhere to the card front. Cut water colour paper a little smaller than the first mat layer and add colours with water and zig markers. Blend very well with a brush. Choose colours like pinks, blues and yellows. You can also use distress inks. Let this dry very well and adhere to the first mat layer. Cut a frame from pattern paper and adhere this on water coloured background using foam tape. Stamp the treat van cupcake treats in jet black Archival ink on white card stock. Colour with Zig markers. Using the coordinating die, cut the images. 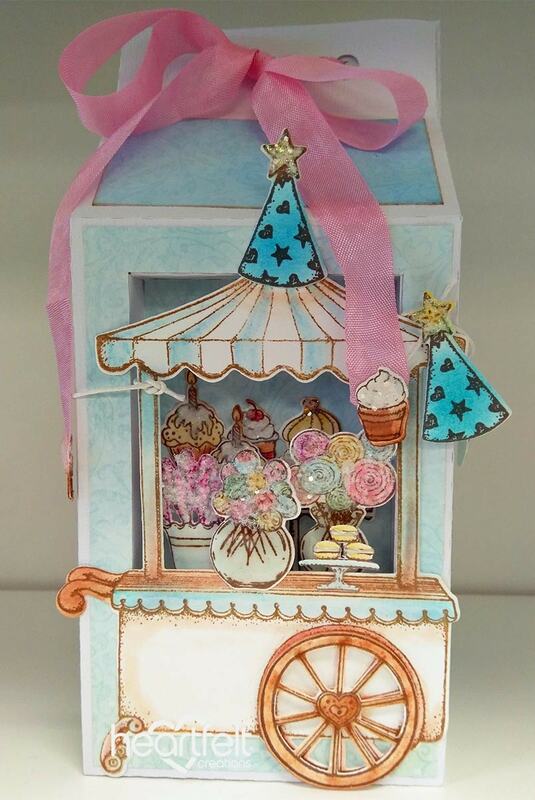 Cut the sweet shop die cut twice and layer it with the stamped image to add a little dimension. 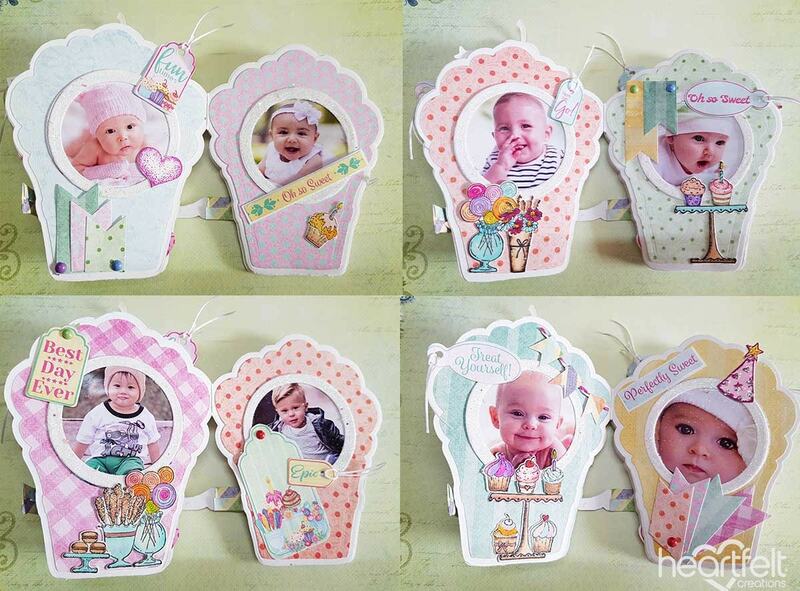 Adhere and arrange all the images using foam dots on the card front. Stamp the Cherry blossoms flowers on deluxe flower shaping paper and colour with same inks. Stamp the leaves in Library green. Cut with matching die and shape the flowers in the shaping mold. Arrange the flowers and leaves on the top left corner. Stamp the Sweet shop sentiment on white card stock and cut with an oval die that fits the words. Cut a bigger mat layer and adhere the first oval on the bigger oval using foam dots. Attach ribbon and adhere as shown on the card. Finish by adding Nuvo drops on the card front. Instructions: Card size: Open-7 1/4" x 11, closed-6 1/2 x 7 1/4". 11" piece is scored at 3 3/4 and 6 1/2" (starting at left side). Cut 2 white Sweetheart Borders and glue 1 to each end of the 11" piece. Cut striped decorative paper 2 1/4 x 6 3/4" and 3 3/4 x 6 3/4". Cut Eyelet Album Tags, 1 from white and 1 from hot pink and the inside smooth edge part from white for the sentiment. Use the "Hope your day is as special as you are" sentiment masking out the "special" then replace it with the "sweet" from Sweet Shoppe, stamp it with Vibrant Fuchsia. Split the white eyelet tag in the center and put half under the top of pink tag and half under the bottom, cover the center sides with cute enamel dots. For the front of card start with the hot pink base 4 3/4 x 6 3/4". Cut the Intricate Swirl Frame from white, cutting out the center with the center portion of die set at the same time. Add blue cardstock to the back of frame opening and cut some green grass with the border punch for the bottom. Stamp Sweet Shoppe, flower pots and sweets using black Memento Ink then color with Copics. Stamp Sweet Shoppe sign using Vibrant Fuchsia and cut with oval die. 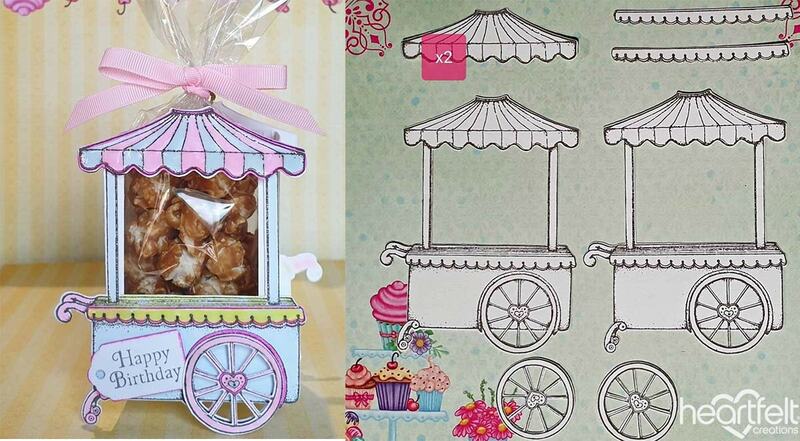 Glue Sweet Shoppe cart to frame and pop up the extra wheel and extra scalloped side. Double pop the flower pots at each end of the cart. Tuck the extra wheel under some of the grass. Glue the back roll of sweets to the frame and pop up the front roll to give some dimension. Pop up the sign on the top left of cart. Glue the pink front to the left panel of Z fold. Stamp Cherry Blossoms with Buttercup and sponge then die cut. Stamp Leaves with Leaf Green and sponge with Vivid Chartreuse then die cut. Run the blossoms and leaves through the die cutting machine in the mold to shape. Glue 2 blossoms for each flower and add some Flower Soft to the centers. Glue clusters to each corner. Instructions: Card base is 8 1/2 x 5 1/2". Create card base using white cardstock 8 1/2 x 11", score and fold at 5 1/2". Cut Sugarspun Paper Collection to 8 3/8 x 5 3/8". Glue it to the base of card. Using Eyelet Rectangle & Basics Die, die cut larger rectangle using green paper, and smaller rectangle using blue paper from Sugarspun Paper Collection Then die cut two frames using blue paper from paper collection, for each one use two sizes of dies to create a frame. Adhere onto card base using Darice Adhesive Foam Strips. Die cut lacy diamond from paper collection, trim to size and adhere onto card base, tucking the edges behind largest rectangle. Instructions: Click here to view a larger photo of this project and diets you'll need to create it. Using your Sweet Shoppe stamp set, stamp your shoppe and wheels twice using your Espresso Truffle ink on copic blending card. Stamp the shoppe 2 more times to cut out extra trims. Die cut your shoppes out using the coordinating die. Trim off the two roof sections and using the scallop trim die cut 2 trims. You will end up with 2 full shoppes, 2 roof trims, 2 scallop trims and 2 wheels. Color you stamped images using copics. Roof trim stripes BG000, RV02, edge roof trim in RV04, shoppe base BG000, shoppe trim Y04 and edged in RV04, shoppe handles and feet RV02, wheel trim RV04, wheel inner RV02, heart BG000, outer heart RV02, trim around the heart RV04. Using your Special Birthday Sentiment Stamp set, stamp your "happy birthday" using espresso truffle, die cut with tag die from your ornamental tag die set. Ink the edge using your archival fuchsia ink. Cut your inner treat box - Trim your white cardstock to 10 1/2" x 3", using a score pal, score the long edge in 1/4" on the left and the right. Now score at the 4" ink mark on the left and the 4" mark on the right, this will leave you 2 1/2" in the middle. Place a small cut line where your score marks over lap and fold in to make a U shape, when dry cut 2 acetate mats 4" x 2 1/2" and glue on the insides of your white base to create the inner box of your treat box. Using 3D Dots, adhere your striped roof, scalloped trim and wheels. Using 3D Dots, adhere your sentiment in the bottom left corner. Fill a clear cello bag with popcorn or treats of your choice, tie a matching ribbon around top so the bow lines up with the top of your treat box. Apply glossy accent to the trims - roof, scalloped trim and the wheels. Instructions: To create, take your Tags and Accent die and diecut the base layer die using white cardstock. You will then take a sheet from the Sugarspun collection and diecut using the next coordinating layer. Adhere to the white tag you just diecut. Now take your die from the Daydreams Bridge die and diecut the large center die from white cardstock. You will then adhere this cut piece onto the tag you created in the first step. Now stamp the sugarspun collection stamps onto the watercolorpaper using the stazon ink. Color the different images using the zig clean color pens in the chosen colors and diecut using coordinating dies. For the sentiment, cut from the sugarspun paper collection and adhere to the bottom portion of your tag. Assemble your tag as pictured once all the elements are complete. Instructions: My card size is 5 x 7". Make card base and then cut out the frame and glue it down to card front. Stamp the cart in Lilac Posies ink and stamp the extra wheel out of Teal Zeal ink. Using coordinating dies cut out and color using the Dove Blender pen and ink. Glue the extra wheel on and use Hot Mama Prills in the center of the wheel. I cut out the border die using a piece of yellow paper and then cut pieces to fit along the front of the cart. Glue into place and allow to dry. Stamp the different elements using Tuxedo Black Memento ink and cut out using the coordinating dies. Color using various inks and the dove blender pen. I also used the stack and store daubers to color some of the pieces. Next, add glitter and the Prills and set aside to dry. When everything is dry, add dimensional tape to the cart and glue to card front. Add all the elements and then pick out a tag from the paper and use dimensional tape to adhere to the card front. Instructions: Cut a piece of white card stock 5 1/4" x 4 1/4" and fold in half. Place the largest cupcake die so that the die extends over the fold so that the fold doesn't cut. Die cut. Using a sponge dauber, ink around the edge with Aquamarine. Stamp 2 complete cupcake images on white card stock with Aquamarine. Color the cupcake liner with pencils. Die cut with coordinating die. Stamp only the frosting 3 times; 1 each with Dandelion, Magenta Hue, and Tangelo, sponging with the same inks. Die cut and then layer them on one of the Aquamarine images. Add to the card front. Stamp 2 of the bow/ribbon from the cupcake with Magenta Hue and die cut with coordinating die. Adhere one to the front of the card. Stamp the sprinkles with the same inks on white card stock. Stamp the heart and cherry with Magenta Hue, die cut with coordinating dies and then add glossy accents to the heart and cherry. Add the cherry to the cupcake on the card front. Add the sprinkles. Inside: Using the second image, cut a slit in one of the frosting layers, big enough for the gift card. Glue only around the edges to the card base. Add the bow to the cupcake. Die cut the background layer from the Ornamental Tags die from white card stock. Die cut the second layer from blue card stock. Cut the 'gift for you' from white card stock. Layer the 3 pieces together. Slip into the slot made for the gift card. For the top inside: die cut the cupcake without stamping, ink the edge with Aquamarine, and add to the card. Stamp the sentiment on white card stock with Magenta Hue. Hand cut and edge with Aquamarine. Stamp the candles with Aquamarine and Magenta Hue. Die cut with coordinating die and add to card. Use yellow and crystal Stickles. Add heart from sprinkles stamp and pink heart with glossy accents below sentiment. Instructions: Find the 2 sheets of patterned paper with the pink border. Cut each at the 6" mark, and piece the two together. Cut a piece of the pink gingham patterned paper that is 2.5 x 9" and flag the ends. Adhere to the background. Cut a strip of the yellow striped patterned paper that is 5.5 x 12". Cut 2 strips of white cardstock that are 1 x 12", and 2 of the striped patterned paper that are 1 x 12". Adhere these layers together and adhere across the background patterned paper. Cut a strip of the green polka dot patterned paper that is 0.75 x 12 and adhere to the yellow patterned paper. Mat the 2 small photos together using white cardstock. Adhere to the layout using crafty foam tape. Find and die cut out the large pink tag, and small green striped tag. Adhere to the left of the matted photos and add burlap string bows. Find and cut out the "Perfectly Sweet" sentiment and mat in white cardstock. Adhere below the matted photo using 3D foam squares. Add gems. Add white buttons to the corners of the background. Using an embossing pad and black embossing powder, add the "Happy Birthday" sentiment to the Sweet Shoppe. Adhere the Sweet Shoppe to the right of the matted photos using 3D foam squares. Add the wheel also using 3D foam squares. Add the jars of sweets using 1 layer of foam squares and the macarons using 2 layers. Add the birthday hat to the photo using an adhesive dot. Using Stickles I added lots of sparkle to the stamped images. Instructions: Cut card base using the outside cupcake die from the Sugarspun Cupcake Die, overhang the die over the top of the card to prevent the top from cutting. Stamp large cupcake and cherry from the same set in Jet black on water color paper, color with Zig markers, and cut out with corresponding dies. Accent the cupcake with Crystal Clear Glitter. Adhere the cupcake and cherry with foam tape to the card base. Stamp the flowers from the Tweet Cherry Blossoms Cling Stamp Set in Pearlescent Coral, sponge with same and cut out with corresponding dies, and sculpt with the 3D Cherry Blossom Shaping Mold. Add prills to the centers of the flowers. Sponge blossoms with adhesive and cover with Crystal Clear. Stamp, and sponge leaves from the Tweet Cherry Blossoms Cling Stamp Set in Bamboo Leaves, cut out with corresponding dies and sculpt with the 3D Cherry Blossom Shaping Mold. Cut sentiment from paper collection and adhere with flower and cherry to card, as shown. Take another pattern paper from the collection measuring 5.875" x 2.125" and distress the edges and adhere it on the centre of the card as shown. Cut two Petite Pocket Accents Die on white cardstock and adhere them on the top and bottom edges of the centre panel. Instructions: Cut a piece of white cardstock 12" x 6", score at 6" along the long side and fold to create a base card 6" x 6". Cut a diagonal striped 6" x 6" panel from the paper collection and adhere to the front of the card. Cut a piece of white cardstock 6" x 6" and using the plain cutting die from the HCD1-7212 Petite Pockets Accents Die set cut each end of the card. Die cut two decorative dies from white cardstock, add Frosting Powder using Dries Clear glue on a damp sponge and adhere to the die cut ends. Die cut two lace edges from white cardstock, add Frosting Powder using Dries Clear glue on a damp sponge and adhere to the edges as shown. Die cut the eyelet oval using the eyelet die from the HCD1-7156 Eyelet Ovals & Basics - Small set and adhere to the front of the card as shown. Die cut an oval using the largest plain die from the HCD1-7156 Eyelet Ovals & Basics - Small set and emboss with the Swiss Dots embossing folder and adhere to the front of the eyelet oval. Adhere this oval to the card front with foam tape. Stamp the cupcake image from the HCPC-3871 Sprinkled Confetti Stamp set in Jet Black ink on Iris cardstock. Colour with Zig Clean Colour Brush markers and die cut with the coordinating die. Add Crystal Clear glitter with Dries Clear glue on a dry sponge. Add Coral Seas Prills by dotting Dries Clear glue on the icing. Stamp the candles from the HCPC-3870 Sugarspun Cupcake Stamp set in Jet Black ink on Iris cardstock. Colour with Zig Clean Colour Brush markers and die cut with the coordinating die. Adhere two candles behind the icing and adhere the cupcake to the oval as shown. Die cut the tag using the coordinating die from the HCD1-7202 Album Tags & Accents Die set and add to the cupcake as shown. Stamp the dishes, sweets and cupcake images from the HCPC-3872 Sweet Shoppe Treats Stamp set in Jet Black ink on Iris cardstock. Colour in with Zig Clean Colour Brush markers and die cut with the coordinating dies. Add Crystal Clear glitter to the sweets and cupcakes with Dries Clear glue on a dry sponge. Add the dishes to either side of the oval and add the sweets and cupcakes as shown. Instructions: Take a 4 1/4" x 5 1/2" top folding white cardbase and use the largest cupcake die from Sugarspun Cupcake Die to cut it so that the top edge of the die is above the fold line. This will create a hinge for our shaped card. Instructions: Cut white card stock 8.5" x 5.5", fold in half with side fold. Cut black card stock 4 1/8" x 5 3/8", add to card front. Cut white card stock 4" x 4 7/8", emboss with dot embossing folder. Die cut largest Ornate Pockets Accent Die from white card stock. Adhere embossed piece to Ornate Pocket Accent, leaving just the bottom edge showing. Adhere to card front. Stamp cupcake twice on blue card stock, twice on brown, once on yellow, and once on pink card stock with Jet Black. Color the cherries and shade the cupcake liners with pencils. Color the hearts with red glitter gel pen. Die cut cupcakes with coordinating die. Cut out the brown pieces as shown and the pink and 1 blue frosting by hand. Paper piece and add glossy accents to cherries. Add yellow cupcake to card and then add blue cupcake with foam tape. Cut a piece of black card stock 1 3/8" x 4". Cut a piece of pink plaid design paper 1 1/4" x 4", add to black piece. Stamp sentiment on yellow card stock with Jet Black. Die cut with 3.5" arrow die. Add to pink design paper. Stamp bow from Sugarspun cupcake stamp on blue card stock with Jet Black. Die cut with coordinating die. Add to arrow. Add this completed piece to card. Add Stickles to bow. Stamp numbers on pink card stock with Versamark and emboss with Clear embossing powder. Die cut with coordinating die. Add '16' to cupcakes. Instructions: The finished card measures 9-1/2 x 7- 1/2" and consists of two layers. For the card base cut white cardstock 19 x 7-1/2", score at 9-1/2" and fold. Choose pattern paper from the collection and cut it to size 1/4 inch smaller than the card base, adhere on the white card base with clear drying glue. For the second layer cut pattern paper 8- 3/4 x 6-3/4" and adhere on top of first layer with 3D foam tape. Die cut white card stock twice using Petite Pocket Accents Die and color with Archival ink cobalt. Arrange the die cutouts at the upper and lower edges of the second layer of pattern paper with clear drying glue as shown. Next, die cut white cardstock using the largest die from the Eyelet Circle & Basics Small Die set and mat with pattern paper. Also die cut out white cardstock using the Festive Holiday Die. Adhere the die cutouts in the center of the card with 3D foam tape as shown. Stamp white cardstock with images from Sugarspun Cupcake Cling Stamp Set, Sprinkled Confetti Cupcakes Cling Stamp set and Sweet Shoppe Treats Cling Stamp Set, die cut using coordinating die and color the images with water colors. For the flowers, stamp white cardstock with Large Sweet Peony Stamp and Small Sweet Peony Stamp Set using Archival Ink - Plum. Die cut using coordinating die and color the petals with Archival ink - Flower Cactus. Shape the petals with Groove tool. For stamping the leaves, use Archival ink Library Green, die cut the images with coordinating dies. Color the Leaves with Archival Ink Fern green and Leaf Green. Shape the leaves using the 3D Leafy Accents Shaping Mold. Die cut ticket and small tags out of paper collection using Ornamental Tags Die and Ticket and Tags Die. Once all the elements are ready arrange them as shown. Apply Crystal Clear glitter on flowers with clear drying glue. WOW! What a great line-up of inspiration! I especially like those shape cards...some of them look good enough to eat! Great job design team!! Everything is sooo cute! Your artists have all done a terrific job in their Sugarspun creations!! I am so excited for my order to be delivered. Once again Heartfelt's designs are outstanding and so usable. Thanks so much. The large cupcake stamp and dye set is awesome! I am already thinking of ways I can use this set to make my sister in laws Christmas cards for her baking club!